The Wahoo KICKR 2 or as Wahoo calls it, the New KICKR, was introduced earlier this month after three years of their flagship product, the original Wahoo KICKR that took indoor cycling into a whole new level. I just received mine, a final production unit that I purchased and had a chance to spend some time on it. I am underlying the word “I purchased” here so you know this review isn’t influenced by a free product from Wahoo or anything like that. I usually like to review trainers after spending some intense training sessions. However, due to the off season, my training have been somewhat sporadic and not that intense. However, I do have a good feel for the trainer. Design: Just like the old KICKR, the New KICKR is very well made and solid. Actually, from a design perspective, not much have changed other than introducing the left handle and ANT+/BT LCD lights as you see in the photos below. Compatibility: Wahoo KICKR is compatible with 9-11 speed bikes and works with 24″, 650c, 700c, 26″, 27.5″, 29″ wheels. The HUB type is 130/135mm QR and 142x12mm (with adapter). If you ride a Campagnolo, you will need to get the Wahoo Campagnolo Freehub adapter.From a software perspective, it works with Apple devices (MacOS, iOS) Windows and Android and can interact with Zwift, TrainerRoad, SufferFest and many other 3rd party apps. Noise Level: The New KICKR noise level is noticeably quieter that the old KICKR. Road Feel: The road feel in the old KICKR was very good. With the New KICKR, I didn’t notice much change but it’s still very decent. Accuracy: In my tests, I found it to be very close to my power meter (P2Maxx) and within +/-1. Also, you are able to sync your bike powermeter to control the KICKR from within the Wahoo App so you are not limited to the power produced by Wahoo KICKR . More on that later. Initial Setup: Initial setup was very straight forward. The trainer is heavy (about 47 pounds), so lifting it and adjusting the legs is something you probably would rather do once. However, it isn’t really that hard to fold it back and take it out somewhere. 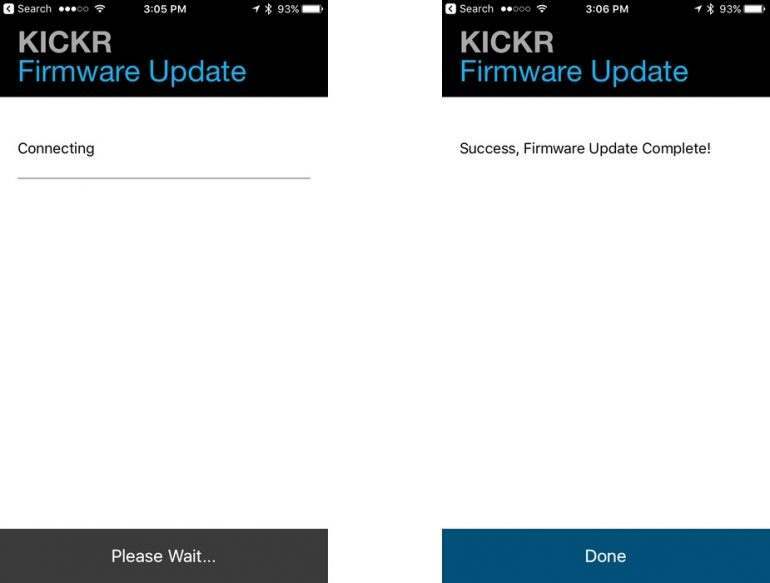 Updating the firmware and setting within the Wahoo KICKR app was very simple and straight forward. Ease of Use: This is a direct drive trainer so you need to remove your rear wheel to mount it on the trainer. Some people can find this inconvenient or are just not comfortable removing the rear wheel. If that is you, then you might want to consider the KICKR Snap or a different brand with a wheel on design. Once your bike is attached to the trainer, everything else is straight forward. You can pair it to 3rd party apps and be riding in minutes. That’s it. Now let’s dig a little deeper into the trainer. The trainer came in a heavy box as you see in the photo here. Once unpacked, the legs fold out by pressing the blue lever on the side. Adding the side handle distributed the weight much better than the old KICKR and made handling the trainer and carrying much easier. Once setup, you can adjust it for the type of bike you have. It comes with 11-speed cassette by default but can be changed to 10-speed or 9-speed if you wish. Wahoo includes a spacer for 10-speed. Changing the cassette is just like changing it on your bike or if you don’t know how to do it, then take it to your bike shop and they can easily do it. The other nice thing Wahoo did, is adding the ANT+ and Bluetooth LCD lights. 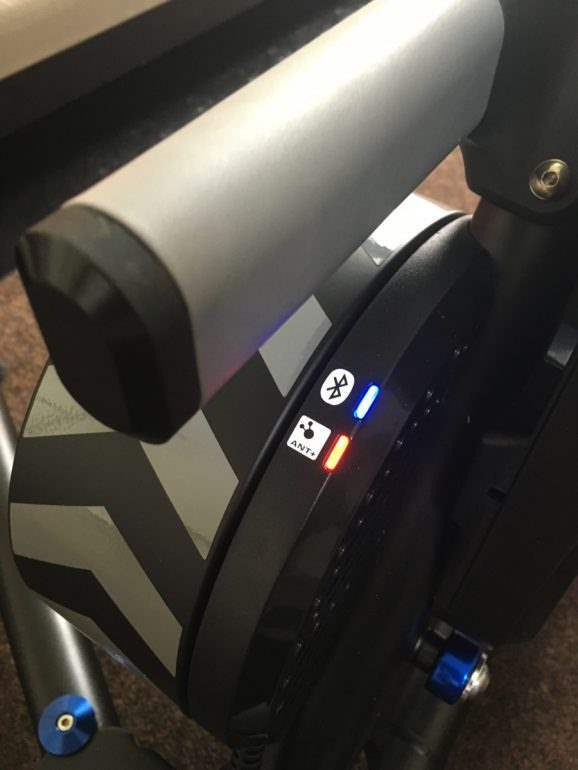 These light let you know if the trainer is connected to a compatible device and communicating. 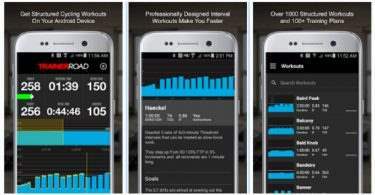 You will need to download the Wahoo Fitness app for Apple devices, or Wahoo Fitness Workout Tracker for Android to be able to pair it to the trainer and set everything up. Once paired, Wahoo will perform a software update. This shouldn’t take long at all. First thing you need to do before getting on the trainer and working out is calibration. 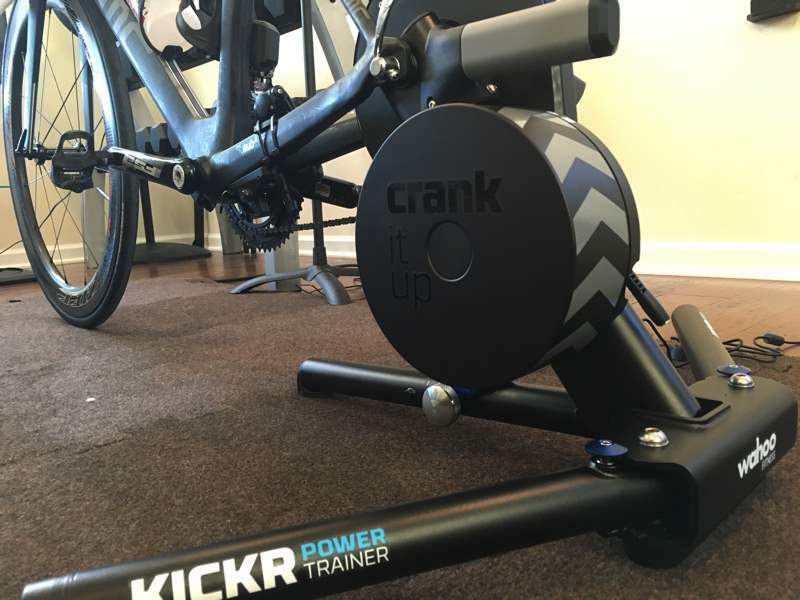 To calibrate your New KICKR, start pedaling for about 10 minutes and let the trainer warm up. Login to the Wahoo Fitness App, under Sensors, select your KICKR, then click on Spindown. You will need to slowly accelerate to 22.36 mph, then stop pedaling, and let the KICKR coast down until the spin down completes. The Spindown is used to determine the power required to overcome friction in the bearings and belt on your KICKR to give you more accurate power. It is not necessary to do a spin down before every ride. However, it is recommended to do one if you transport your KICKR, or every 2 weeks. Origianlly I had issues with my calibration and KICKR was reporting watts that were 40+ watts lower than my powermeter. Wahoo recommended I do advance calibration. After that, power numbers were spot on. Here is a ride from Zwift climbing up to the tower. Here is the full ride. This is exactly what you want to see. Beautiful two lines on top of each other. Here is the full climb section to the tower. You can see a little separation towards the end when I was just trying to make it up the final stretch. The below are couple of sprints I did at the end. Nothing to report other than a perfect power accuracy. If you have a power meter on your bike, then I would recommend doing this. Basically, this will allow your Wahoo KICKR use your bike power meter to control resistance. To do this, first you need to add your power meter to “Sensors”, open the Wahoo Fitness App, click on sensors, and click on add new sensor. 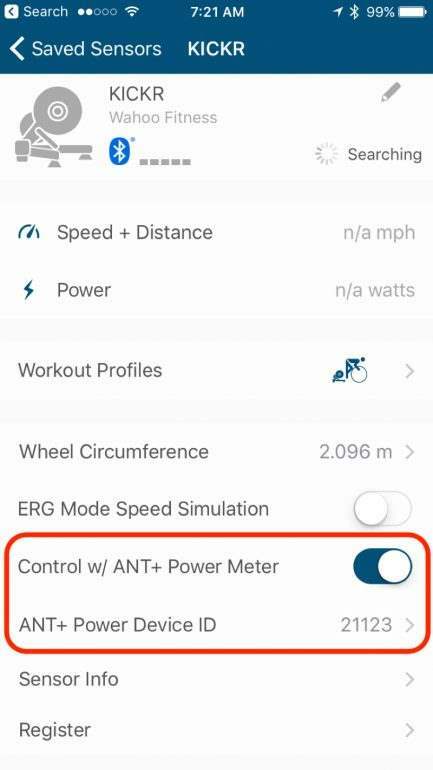 You need to have ANT+ bridge or ANT+ key connected to your phone if your power meter is ANT+ compatible only. Once your power meter is found, then click on add. Then Go back to Saved Sensors, and turn on “Control w/ANT+ Power Device”. The New KICKR is considerably quieter than the old KICKR. 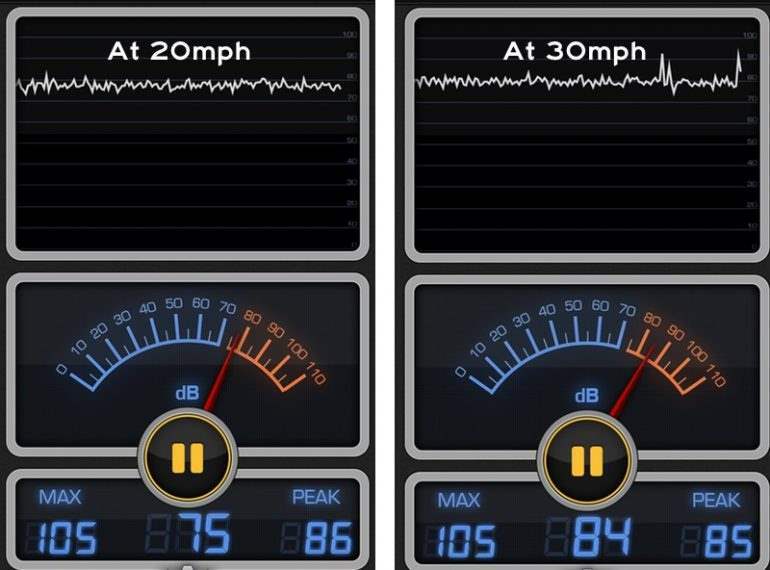 Running my trusted decibel test at 20mph and 30mph. 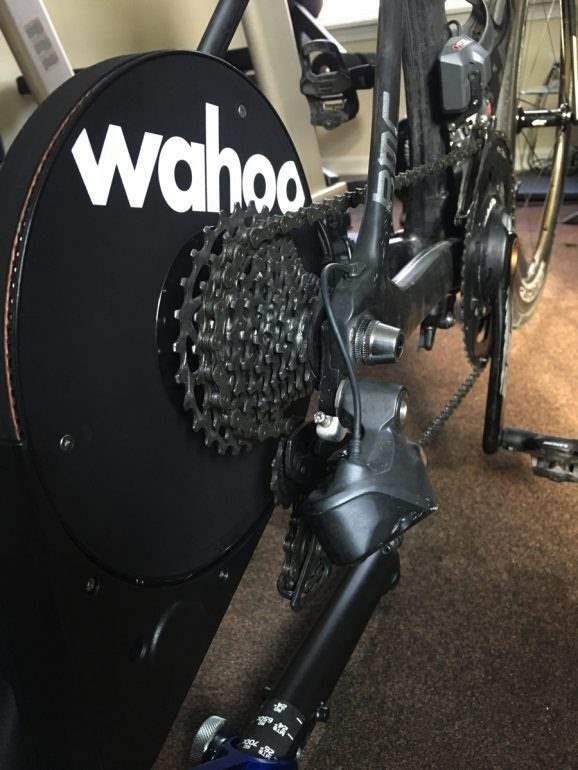 Wahoo claims the Wahoo New KICKR creates only 61 decibels at 20mph. However, when I ran my tests at 20mph, it came to 75 decibels, and at 30mph 84 decibels. I am not sure how Wahoo performed their testing but noise level can vary. Type of floor, walls, furniture and many other elements can impact the sound level in the room. My training room tends to create a lot more echo than other room in my house so take that into consideration. From my own experience with other trainers, the New KICKR is quieter than many other trainers I have used and have no problem using it at 5am and worry about waking up the kids in my house. 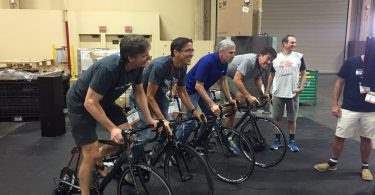 Wahoo KICKR has been in the indoor bike trainers market for many years. They have changed the smart indoor bike trainer market just like the iPhone did to the smart phone market. It’s is a very solid trainer and I have no reservation recommending it to anyone looking for a good trainer that will last many years of hard training and abuse. Wahoo usually don’t discount the Wahoo KICKR. Since the new KICKR was just released, I doubt it will be part of their black Friday deals like they did in the years past with the old KICKR. 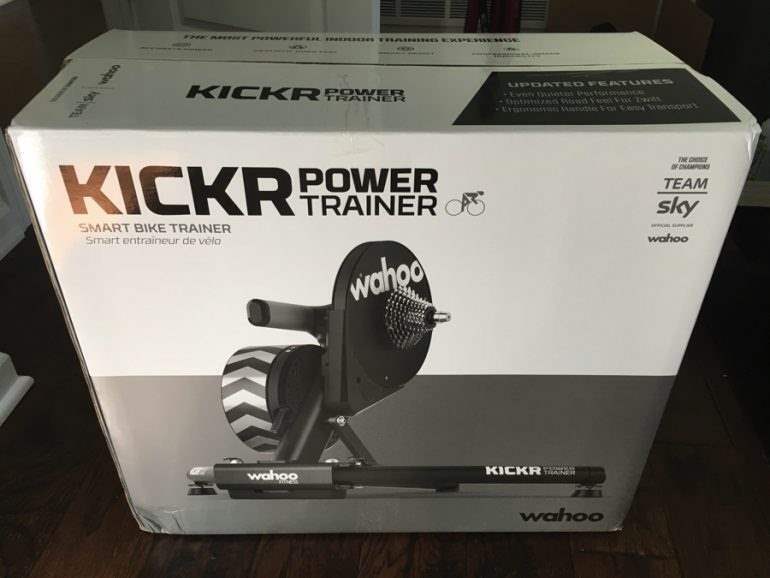 You can get the KICKR directly from Wahoo Fitness and you will get free shipping. The best you can probably get with the New KICKR is through REI. With a VIP membership, you can save some money as reward dollar. REI will give you back 10% ($120) on the New KICKR back to your account. Also, if you buy from REI, you will help support the site and I thank you for that! I appreciated your review of the new Kickr. I have a quick question for you? I am currently a little bit thorn since I can get a Kickr1 2015-2016 on sale at $400 (CAN Dollar) off the retail price of a Kickr2 2016-2017 at a local bike shop. I already have an independent power meter but I am really looking forward to the ERG mode. I could probably live with the noise of the first generation since I wear headphones, although the high frequency siren-type sound maybe annoying in the long term for the family while I am in the basement pedaling. The new handle and LED lights for connection status are very nice but not a deal breaker. Is there a massive improvement in terms of accuracy? I also read that the quick responsiveness was improved from 150 watts to 500 watts and the maximum hill grade effect was increased from 15 % to 20 %. 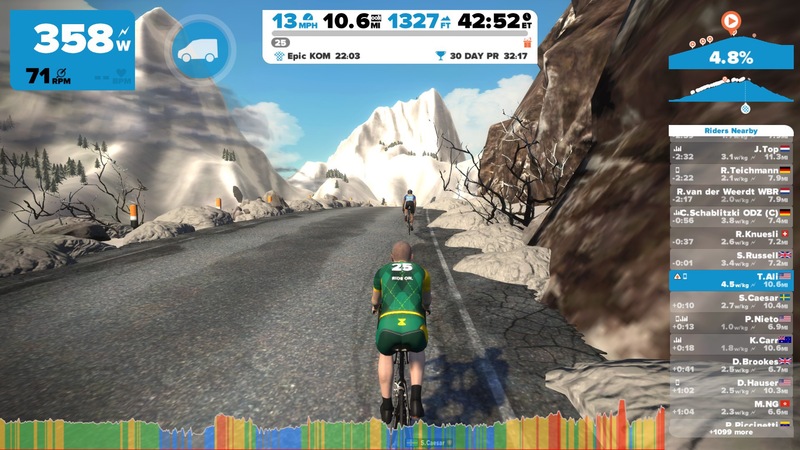 Since this would be my first smart trainer, the new responsiveness setting may be useful, but overall can this be a “must” today or over the next years given current and future outdoor cycling/racing simulation apps? Or, does the settings of the first generation are still sufficient for a while? I am an enthusiast but a not an amateur racer/athlete. Given this good deal and the aforementioned feedback I got, I am really leaning toward the Kickr1. Am I forgetting something about other things/issues that would make the Kickr2 a better option for the long term (couple of years) and prevent buyer’s remorse? Looks like you did a lot of the research and understand the difference between the two. The KICKR 1 might be good enough if noise level isn’t an issue for you or won’t be an issue with your family. I found the KICKR 2 more accurate than the 1 but still not as good as other higher end trainers such as Tacx NEO or Elite DRIVO for example. But sine you have your own powermeter, then you should be able to use your powemeter reading to control the KICKR after pairing it through the Wahoo app as I described in the post. I am a big proponent to getting the most recent product and since the old KICKR was basically Wahoo’s first smart trainer, I think it’s worth the extra money to get the updated version and go with KICKR 2… IMO and you will have it for many years to come without having to worry about any issues. Would you be able to use the current sale on the KICKR2 and ship to Canada? Excellent summary. Ive been reading about which trainer to get and you just helped me decide! Features and noise level … esp noise level are big for me. Im running on an old fixed velt LeMond Revolution … which runs much quiter now Ive removed the flywheel guard. Happy to help Jock. Let me know if you have any question.